The neo-gothic arch is all that remains of the 18th century premises of Thomas Blakemore, wool merchant and linen draper. In 1853 John Warner, draper, acquired the premises and converted them to three units, a shop either end and Warner House in the middle. The shop to the right became an ironmonger's at the end of the 19th century and was acquired by John Tucker in 1905. 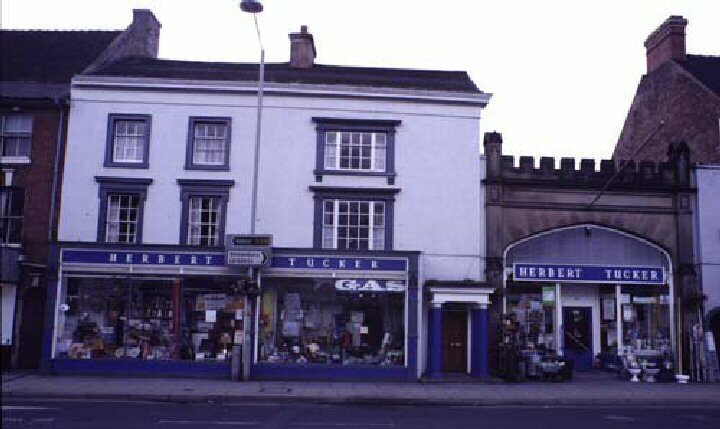 The one on the left remained a drapers shop until 1958, when Herbert Tucker bought it for the sale of hardware. The premises were sold to a developer in 1989 - during renovation the building collapsed, the site remaining derelict until an exact replica of the former building was erected, as the Library, in the year 2000.